The analysis of liquid samples, including volatile liquids, can be done quite easily on the CE440 Elemental Analyser without sacrificing accuracy or precision and without the need for expensive liquid autosamplers. Exeter Analytical has created a protocol for dealing with volatile samples. 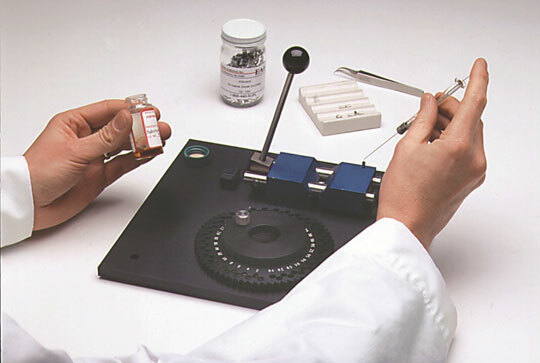 The protocol discusses the key techniques in sample handling and an introduction to the model 440 sample sealer. The protocol incorporates a three-stage approach – sample injection/weighing procedure, use of the EA sample sealer and the configuration of the model 440. The protocol describes how to precisely injected liquid samples into capsules and seal with a cold weld. Those very volatile samples, in particular petroleum products, tend to creep up the capsule as the sample become less dense and small portions of the sample may end up above the seal. The protocol discusses the approach to minimise sample losses. By following the Exeter procedure for handling volatile liquids, Model 440 users can now be assured of quality results. Featuring a horizontal furnace design, the Exeter Analytical Model 440, allows analysts to routinely and simply produce accurate and precise data on wide ranging sample types including liquids without system re-optimisation, saving precious time and reducing running costs.